Whether you’re a newbie at hunting for the perfect job or a seasoned professional, whether you hate salary negotiations or love them, the truth is it’s important to master salary negotiation strategies. Avoiding traps is essential to landing an offer that you deserve. Here are 10 mistakes you should steer clear of when bargaining salary terms. This is one of the biggest mistakes when hunting for a job. Settling for salary terms imposed by the hiring manager can have severe repercussions later in the future. Studies have shown that women and young-job seekers often make this mistake because they don’t want to offend, or because they’re too nervous to ask for what they want. Settling for low remuneration brings negative financial outcomes – apart from earning less, your raises will be smaller, as well as your pension. It’s a mistake to enter a salary negotiation and say exactly how much money you’d like to receive. It can be hard to avoid offering this information, particularly if you’re asked by the hiring manager to state your demands and convey your financial expectations. Handle the situation with extreme care and leave room for negotiations. Give them a number, but also highlight that everything’s negotiable. You can agree to less money and more vacation time, or better money and more working hours. Too many job seekers focus on what they think they need from a job offer, rather than on what they’re entitled to get. Employers don’t want to know details of your personal life, and they’re certainly not interested that you’re not being paid enough. Negotiate the offer you just got, but make sure to enter the meeting prepared. Solid research and exact data will convince a company that they need you. With the great variety and number of salary resources at your fingertips on the internet, there’s no excuse for job-seekers to not be acquainted with their market value. Conduct a thorough research of your potential employer, and make sure you know the company’s negotiation policies, historical salary levels, and performance appraisals. Experts agree that when negotiating, the longer you can make a company wait, the greater power you can attain. Sadly, many job seekers are impatient and they end up asking about compensation and salaries too early in the negotiation process. Mentioning salary terms should happen at the final stage of the meeting, when the hiring manager brings up the money matter. Only then you can start talking about wages, commissions, bonuses, health insurance and additional incentives. It’s tough to land a job offer in this economy, and after weeks of waiting for a phone call, you will be tempted to accept whatever deal a company has to offer. Unfortunately, most offers are not great, and if you’re not patient enough you end up accepting a job you will eventually resent. Another crucial mistake people make when attending a job interview, is to reject an offer too soon. If a company can’t afford to pay you the amount you expected them to pay, engage in a negotiation. Talk about your best assets, highlight main reasons you would fit in their company, and be open to additional incentives. They can’t come up with a better offer now; but maybe if you ask, they will have the means to do it a few months. If you’re interested in a type of job and you also like the employer, but the offer is not exactly what you anticipated, make a counter-offer. However, don’t list too many demands, as this could make the employer withdraw the initial offer. If they can’t offer you more money, center the negotiation on non-financial incentives. 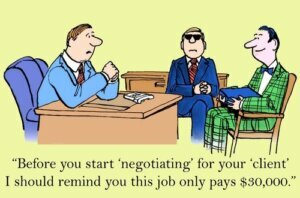 It’s really important to have a professional attitude when dealing with salary negotiations. If you’re being offered an absurd salary package, find a way to maintain a professional attitude. It doesn’t mean that the hiring manager has something personal with you; maybe they just can’t offer more. Decline politely and leave room for future relationships. After an employer has offered you the job and all negotiations have been completed, you should ask to get everything in writing. This is perfectly normal and every employer should agree to a written contract with clearly stipulated terms and conditions. Verbal agreements should be avoided, no matter how trustworthy a hiring manager may appear.